Travels with a Tin Donkey: Auf Wiedersehen, Jan! 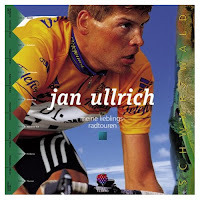 As pretty well all pro cycling fans have heard by now, Jan Ullrich announced his retirement recently. This was not much of a surprise; the soap opera began with his sudden eviction from the 2006 Tour de France just before it began, followed soon thereafter by the cancellation of his contract with T-Mobile. He has not raced professionally since his victory in the Tour de Suisse in June. Without either a racing license or a team, his prospects for 2007 did not look very promising, and the shadow of Operacion Puerto hangs over him still, along with other riders suspected of doping. To have what was once such a promising career end on such a subdued note is a better lesson on the weight of expectations. Perhaps the greatest natural cycling talent of his generation, Jan Ullrich's gift evaporated with accidents, poor preparation, bad management--and the problem of perhaps not having a strong enough will to compete against the most disciplined rider of any generation. I still recall when after his Tour de France victory in 1997 that commentators said he would be capable of winning six Tours. Little did we know that someone else, a cancer patient at the time, would go on to get those wins, and one better as well. In all, there were 65 victories and an impressive number of podium finishes at the Tour de France. 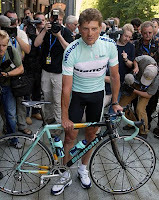 In 2003, when Jan Ullrich rode for Bianchi and came closest to winning the Tour for a second time, his elapsed time was actually less than Lance Armstrong's, who won due to his USPS putting in a marvellous team time trial performance. 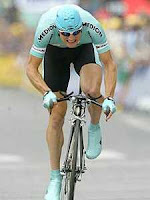 When I lived in Germany, from 1998 to 2002, Jan Ullrich was probably the most popular athlete in the nation. People liked his mellow, relaxed style and his apparent friendliness. They forgave him his lapses in training and errors of judgment, pointing out that he was merely human--unlike that machine from Texas. The two riders had some similarities, both being raised by their mothers in a single-parent household. But Jan Ullrich was raised up in the East German sports system, which picked out talent early and demanded total obedience. Unlike Lance Armstrong who had to fight his way to the top and, in his early career as a pro racer was like an unguided missile, Jan Ullrich was guided by others. It is not clear if this reliance on others, and a lack of emphasis on self-discipline, ultimately injured his career in a brutally hard and particularly unforgiving sport. Jan Ullrich, Author: "My Favourite Rides in the Black Forest"
Last year when I was at the Tour de France with a group of German friends everyone was pretty disconsolate over der Jan’s not riding but the level of surprise was much less than I had expected. When I doubted that we would ever see Jan ride again professionally, the whole group agreed. And this was even before T-Mobile fired him. In 2001, a beautiful book of rides in the Black Forest was published, with great maps and hill profiles. These were Jan Ullrich's training rides in one of Germany's most scenic areas. I made a trip to Freiburg to visit friends and we decided to ride the first route in the book, "Over the Texas Pass." We rode through his town of Merdingen, where there was a big "Welcome Back, Jan!" sign to mark his return from the Tour de France and then continued through the beautiful vineyards of the Kaiserstuhl area. As we were riding I saw another cyclist coming the other way, wearing a Champion of Germany white jersey. As he came nearer, I saw the earring: it was Jan himself. It was two or three weeks after the 2001 Tour de France, where he had come second, and a week before the Championship of Zurich, where he also came second. He waved to me as he rode by and after I returned the salute I watched him ride. Like a turbine, smooth and so powerful; like nothing I had ever seen before. This is how I want to think of him. There are those who say that all pro cyclists are dopers and cheats, and they tend to say it with a cynical enjoyment at ruining the pleasure of fans who love a great performance. Jan Ullrich obliged us with many great moments: the 1996 Tour, when he came second and looked as strong as his teammate, Bjarne Riis; the 1998 Tour, when he desperately tried to make up for his one bad day and reel in Marco Pantani; the 2003 Tour, when he crushed Armstrong in the first individual time trial and crashed out in the rain in the second.